Following the announcement earlier about the dual park initiative that is Star Wars Land, Disney returned to the Hall D23 stage at the D23 Expo to reveal more details about the future of their parks. 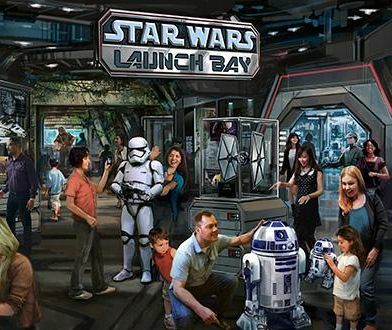 Star Wars Launch Bay – Opening later this year, this interactive experience will take guests at Disney’s Hollywood Studios in Florida and Disneyland park in California into the upcoming film, Star Wars: The Force Awakens, as well as the first six films in the Star Wars saga. Season of the Force – This new seasonal event, beginning early 2016, brings new experiences to both coasts. 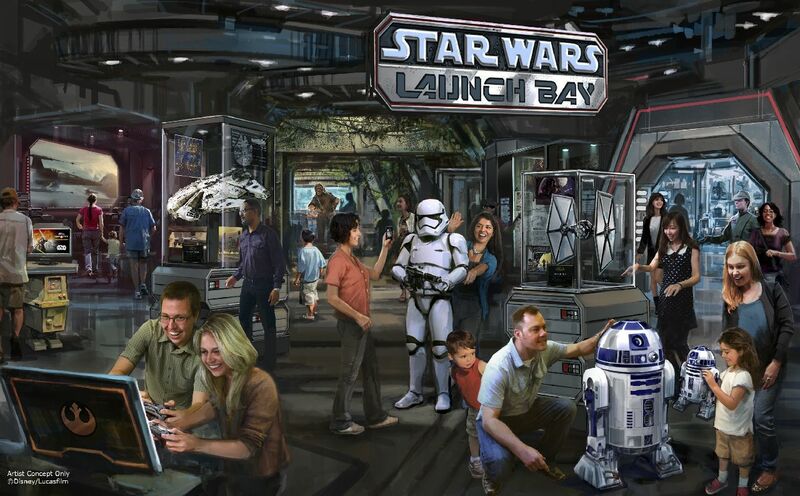 In Tomorrowland at Disneyland park, guests will explore the Star Wars galaxy with special entertainment, themed food locations and Hyperspace Mountain – a reimagining of the classic Space Mountain attraction in which guests will join an X-wing Starfighter battle. Disney’s Hollywood Studios will feature a new fireworks spectacular set to the iconic score of the Star Wars movies on weekend nights. Star Tours – The Adventures Continue – Later this year, Star Tours – The Adventures Continue at Disney’s Hollywood Studios in Florida and Disneyland park in California will include a new adventure featuring locations and characters from the upcoming film, Star Wars: The Force Awakens. Family-friendly roller coaster – This coaster will zip and zoom, plunge and coast as it takes guests on a thrilling, toy-filled adventure throughout the new land on the back of Slinky Dog. Alien saucers attraction – The famous little green aliens from the movie will take guests around for a spin in their very own flying saucers. Toy Story Mania! – Guests glide into the Toy Story Midway Games Play Set and take aim at 3D objects in a variety of fast-paced games, with an expansion that adds an additional track to this popular attraction. AVATAR Flight of Passage – The centerpiece of Pandora – The World of AVATAR, brings guests into one of the most thrilling scenes from the film, in which they will soar on a Banshee over a vast alien world. “Rivers of Light” – Expected to open next spring, “Rivers of Light” will be an innovative show unlike anything ever seen in Disney Parks, combining live music, floating lanterns, water screens and swirling animal imagery. Sunset Kilimanjaro Safaris – This popular attraction will be extended for a new nighttime adventure next spring, where guests will travel through the African savanna amid the magically extended orange glow of the setting sun and discover two species new to the attraction: African wild dogs and hyenas. What will it be like to visit ‘Pandora – The World of AVATAR’? Let the founder of Alpha Centauri Expeditions Tell you all the adventures that await you! Also announced at the panel was the expansion of Tokyo Disney to include Alice in Wonderland Land, Iron Man Experience at Hong Kong Disney, Pirates of the Caribbean: Battle for the Sunken Treasure and Tron Lightcycle Power Run at Disney Shanghai, and Soarin’ around the World for both the Orlando and Anaheim parks. Check out concept art for much of the announced attractions below and sound off with the one you want to see first in the comments!